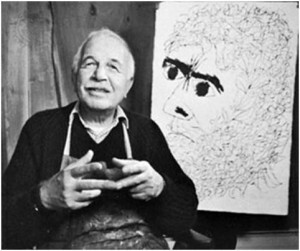 Shahn was born in Kaunas, Russia, which is now a part of Lithuania, and immigrated with his family to New York City in 1906. He learned the lithographer’s trade and became an artist specializing in strong graphic works that combined elements of realism and abstraction, typically to convey leftist political themes. His later work became more introspective and reflective of his Russian-Jewish heritage.